NORTH RIVERSIDE, Ill. (Sept. 14, 2018) - Following his 77 in the third and final round of the 32nd Illinois State Senior Amateur Championship Friday at Riverside Golf Club, Tim Sheppard was candid about his performance. “That’s probably the worst score I have shot in a long time,” Sheppard admitted. Not words you often hear from an Illinois State champion. Nonetheless, Sheppard – bolstered by a 1-under 70 in Thursday’s second round as the rest of the field struggled on a trying track – emerged triumphant to hoist the Earl L. Liff Trophy following a three-hole aggregate playoff with Ted Pecora. Both individuals finished the Championship at 8-over (221), before Sheppard played the three-hole aggregate playoff at even par compared to Pecora’s 3 over to claim the title. The victory was Sheppard’s first in an individual championship administered by the CDGA, an accomplishment that carries a lot of weight for the 57-year-old. Sheppard’s 70 in Thursday’s second round was the only red number carded by the field, which was vexed by Riverside’s small, fast, undulating greens and thick rough. As a result, Sheppard entered Friday’s finale with a four-stroke advantage over Pecora and led by three shots with nine holes to play. However, Pecora made a back-nine charge with birdies on Nos. 14 and 16, followed by a par on No. 18 coupled with a Sheppard bogey, to force a playoff following a 2-over 73, tied for the low round of the day. “I knew I had to shoot somewhere near par or under and have him make a couple of mistakes, which, I got lucky, he did,” Pecora said. “It was nip and tuck,” Sheppard added. Following the conclusion of regulation, Sheppard headed to the range to “get a little rhythm back” before striping a 320-yard drive on the first playoff hole, the 410-yard No. 1. Pecora could not get up and down from short and left of the green, allowing Sheppard to gain a one-stroke advantage after two-putting for par. On the next playoff hole, the par-4 17th, Sheppard put himself in perfect position on the right side of the fairway, while Pecora was blocked out from the green by trees along the left side of the fairway. Another par for Sheppard and bogey for Pecora made the par-3 18th all but a formality. On 18, Pecora found the bunker on the front-left of the green, while Sheppard played it safe by aiming for the right side of the putting surface. 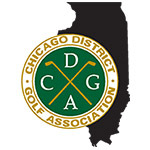 Sheppard’s par putt clinched the championship and a second runner-up finish in a championship this season for Pecora, who also placed second in the 17th CDGA Senior Amateur Championship in August at Itasca Country Club. “Coming in second in both of these now, it’s kind of hard to take,” Pecora admitted.v Pecora’s next chance to claim an elusive title will come in October, when the 2018 CDGA championship slate concludes with the 3rd CDGA Senior Amateur Four-Ball Championship at Indian Hill Club, Oct. 1-4. John Finnin joined Pecora in posting the low round of the day, 73, and surged to a third-place finish at 16-over. Mark Esposito and Donald Langland joined Finnin in third, while defending champion Tom Kearfott was one of five golfers to finish tied for sixth. Dale Blankenship and Daniel Moran earned co-low super senior champion (65 and older) honors on Thursday, both wrapping up the second round with a score of 155, after each shot rounds of 79 and 76.